Not flight – birds figured that out (see 3P principles used to achieve flight). Two `uneducated’ brothers operating a bicycle business, with limited resources, at about $1000 over 5 years, achieved powered flight on the 3rd attempt. In the process of designing an aircraft they created a different way of developing products. Their biggest accomplishment may not have been an airplane, but the development process advancing design and engineering. Deciding the ‘problem of flight’ too difficult to invent an aircraft – and failure (crashing) would mean death – they decided to study and advance the knowledge of flight instead. The approach of creating reusable knowledge – instead of designing an airplane – laid the foundation for the development process known as Knowledge Based Development. Breaking the problem into its components, and moving forward with an intentional & planned approach to studying each they began by understanding what was already learned. Requesting all information on wing design & construction from the Smithsonian, the Wrights proceeded with designing various kites and gliders to better understand the construction and behaviour of wings. Early on gliders did not behave as predicted and the brothers almost gave up. Determined to learn and contribute to the advancement of aeronautical knowledge they persisted through the lowest point, and discovered the aerodynamic tables (in use for 100 years) were wrong – not their assumptions. The only time they could test gliders was in the late fall when their bicycle business was slow and before winter set in, so another way to rewrite the aerodynamic tables had to be found. They made a small homebuilt wind tunnel, to test airfoils, varying the parameters to establish lift and & drag graphs. Based on the new aerodynamic data they built fresh gliders and tested. With confirmation the new wings performed according to their theories, they moved to address the challenges of power and control. The systems approach of addressing a larger problem (flight) by breaking it into components enabled them to define the weight allotment and power requirements for the engine. Unable to source an appropriate lightweight engine, their shop mechanic created one (in 6 weeks) while the brothers addressed power to thrust conversion. Their prior development of aerodynamic tables provided the insight that a propeller is a spinning wing. By reusing the knowledge they had created on airfoils, the Wrights developed efficient propellers for thrust – also in 6 weeks concurrently with the engine. The final component was control of the craft once in the air, where they recognized the problem of flight consisted of both building an airplane as well as learning to fly it. The ability to control the aircraft was from adapting ‘wing warping,’ used to modify lift of the wings. Through wing warping they created basic ailerons – the last flight component – to simultaneously control pitch, yaw and roll of an aircraft. After obtaining all 3 individual knowledge components of powered flight, they could proceed with combining the sub-components and addressing the overall flight system. When they finally built the aircraft, they set about learning to pilot, recognizing the pilot would be a fundamental part of any craft that would fly. rather than trying to just designing a flying machine. Instead of this, the Wrights methodically followed a plan of study and analysis to generate knowledge (a process creating the same knowledge they needed to solve the ‘problem of flight’ first), then followed with designing within those limits. Because of their methods, the Wrights knew they had solved the problem of flight before physically demonstrating it. Although the intent was only to study of flight and contribute in the advancing aeronautical knowledge, the process they followed was so effective the resulting innovation was the airplane. Through the Wrights method for generating the knowledge to demonstrate flight, they invented a different way of product development. In 1920 Orville Wright was appointed to its board and its direction became to promote aviation through applied research which NACA researchers pursued through in-house wind tunnels, engine test stands, and flight test facilities. and the aircraft made its maiden flight on Oct 26, 149 days after. Development team members that were interviewed said the key was knowing most of the trade-off curves prior to beginning development. Despite the need from WWII, without the Wrights knowledge based development methods this pace could not have been achieved. The developers said the aeronautics industry started using computers and reversed the process. They stopped initially generating the knowledge to base the design on. With computers, engineers started skipping right to design, then simulated after to learn; then redesigned, then re-simulated, etc. introducing the predictable redesign loops common in engineering today. The practice of capturing data in the form of physical limit and trade-off curves phased out, the time for bringing a fighter plane into production grew to 20 years, and we almost lost the Wrights invention. The next post covers Toyota’s adoption of Knowledge Based Development and details its resurgence now as Lean Product & Process Development. "**The poor lift of the gliders led the Wrights to question the accuracy of Lilienthal's data, as well as the "Smeaton coefficient" of air pressure, a value which had been in use for over 100 years and was part of the accepted equation for lift." – contrast this with the engineering methods that have also been in use for over 100 years. The experiment confirmed their suspicion that either the standard Smeaton coefficient or Lilienthal's coefficients of lift and drag–or all of them–were in error. They then built a six-foot (1.8m) wind tunnel in their shop and between October and December 1901 conducted systematic tests on dozens of miniature wings . The "balances" they devised and mounted inside the tunnel to hold the wings looked crude, made of bicycle spokes and scrap metal, but were "as critical to the ultimate success of the Wright brothers as were the gliders." The devices allowed the brothers to balance lift against drag and accurately calculate the performance of each wing. They could also see which wings worked well as they looked through the viewing window in the top of the tunnel. 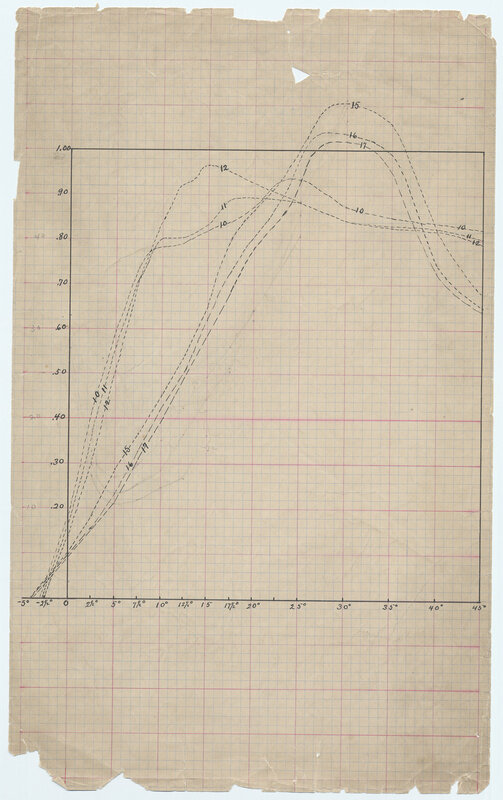 The tests yielded a trove of valuable data never before known and showed that the poor lift of the 1900 and 1901 gliders was entirely due to an incorrect Smeaton value, and that Lilienthal's published data were fairly accurate for the tests he had done. made basic wind tunnel tests on 200 wings of many shapes and airfoil curves, followed by detailed tests on 38 of them. The tests, according to biographer Fred Howard, "were the most crucial and fruitful aeronautical experiments ever conducted in so short a time with so few materials and at so little expense." "Wilbur made a March 1903 entry in his notebook indicating the prototype propeller was 66% efficient. Modern wind tunnel tests on reproduction 1903 propellers show they were more than 75% efficient under the conditions of the first flights, "a remarkable feat", and actually had a peak efficiency of 82%." "They turned to their shop mechanic, Charlie Taylor, who built an engine in just 6 weeks in close consultation with the brothers." Older PostFlight brawl. Will more money make it work?